During the first German TV duel between Martin Schulz and Jean-Claude Juncker, the search to find differences between the two candidates for Commission Presidency continued. EURACTIV Germany reports. 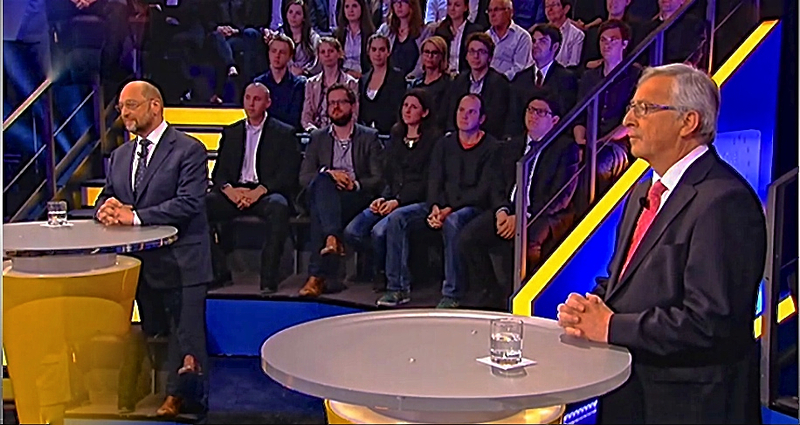 On Thursday evening (8 May), centre-right Jean-Claude Juncker and Social Democrat Martin Schulz faced off in Berlin for the first TV duel in German broadcast on German and Austrian public television. Similarly to their first debate in Brussels one month ago, the candidates had a hard time trying to carve out policy differences between each other. He had only first met Schulz behind closed doors, replied Juncker, former Luxembourg prime minister and chairman of the Eurogroup, adding that he had always made an effort to tell “the true story”. In the debate about the current crisis in Ukraine, it turned out to be hard to find any disagreement between the two politicians. “On the question of war or peace, there is no difference between us,” Schulz explained. “Why should we act as if we do not agree,” Juncker asked. After all, an election campaign was not to be mistaken for the organizing of a mass brawl without reason. During the topic of the ECB’s current policy of low interest rates, one of the moderators pointed out that “we would really like to carve out where you both are not so close together”. The sharpest contrast came up during the debate about fiscal policy. Juncker explained that Europe needed minimum rates for the taxation of companies but that there was also a necessity for tax competition. Schulz immediately interrupted: “I strongly disagree.” Competition among member states for the lowest tax would only lead to profit for “big capital owners”. According to a recent survey, Schulz has an approval rating of 41 percent in Germany, Juncker 24 percent. There is hardly time to debate about who won the TV duel in Berlin. Juncker and Schulz will be facing off again this evening at 18.30, debating the state of the European Union in Florence Italy, together with Guy Verhofstadt for the liberals and José Bové for the Greens. Next May’s European elections will be held on 22-25 May in all 28 EU member states. Members of the European Parliament are elected to represent voters for a period of five years. These elections are the first to be held under the Lisbon Treaty, which grants the European Parliament the power to vote on the president of the EU executive, the European Commission. Parties have taken things into own hands by nominating their own candidates for the top spot. In France, candidates for the European elections are many, especially due to few obstacles that prevent participating. Political parties just have to present 20 candidates (10 candidates and 10 extras) and respect the rules of parity. In other countries, like Germany, parties have to obtain a certain number of signatures to be a validated candidate. However, lists in France that receive less than 5% are automatically removed from the race, which limits the amount of small parties that enter the European Parliament.